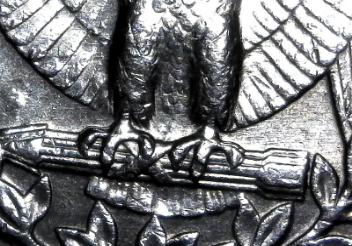 1994 Washigton Quarter DDR? On The Eagles Feet. Just wondering if this is just machining. Your looking at the edge of the devices. That is where you find Machine Doubling. Note how it is flat, shelf like. A doubled die enlarges the devices. MD reduces the normal size of the devices to even smaller. Not a doubled die. Sorry. It looks normal to me.